The land of lamas, Ladakh sheer bliss is blessed by the presence of many monasteries and their spiritual practice. The legacy of Buddhism in Ladakh has been under Tibetan influence and most of the monasteries we see today are from the same period. 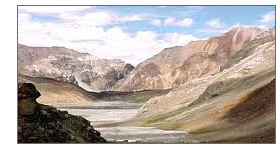 Over 36 monasteries dwell on the isolated Hindukush range of Ladakh. And every gompa is unique in its own right. Known among them are Stok, Alchi, Bardan, Hemis, Thiksey, Sumda Chun etc. Situated in the Zanskars ruined hilltop castle, Zangla monastery is a dwelling complex for 150 lamas. Alongside the banks of river Chenab in Akhnoor region, an ancient Buddhist site of Ambran is located. Dzongkhul Monastery or Zongkhul Gompa is located in the Stod Valley of Zanskar in Jammu and Kashmir State. Like Sani Monastery, it belongs to the Drukpa school of Tibetan Buddhism. Excavations in Baramulla have unveiled the ancient Buddhist heritage of Parihaspora including remains of ancient Stupa, Chaityas and Monasteries. Excavations at Harwan in Kashmir have reinstated the fact that the site was once the thriving Buddhist center. Evidences have revealed the traces of Buddhist heritage including a triple base medium Buddhist Stupa, a set of rooms served as chapels, or as monks residence. Dug out excavations also include copper coins, and other stupa mounds. Also, Ambaran served as the stopover point for Buddhist monks who travelled from Taxila to Patliputra. Another set of excavations in Baramula district Kanispura have revealed treasure trove of Buddhist golden era in India. The traces of Buddhist affiliation date back from 1st Century AD to 6th Century AD. The remains of monastic complex have unveiled the embellished art of decorative terracotta tiles and floral decorations on the walls. Inscriptions in Brahmi and Kharosthi on tiles were also dug out tiles. According to Buddhist literary scriptures, 4th Buddhist Council was held at Kanishpura during the Kushan King Kanishka. Anciently known as Haviskapura, Uskura in Baramulla district have also unearthed monastic establishments and terracotta artifacts.